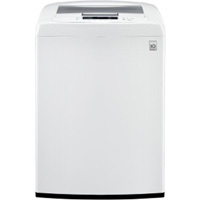 A stylish top load washing machine with a dial and LED display on its panel, this LG model plays a cheerful chime to let you know when your cycle is complete. The stainless steel tub is durable and holds a fair amount of laundry. The washing machine’s technology involves a combination of six washing motions that get the most cleaning action for all your clothes. While there’s a bit of noise when it first starts running, it settles into a quiet, smooth rhythm. For around $600 depending on the online retailer, it’s a highly efficient performer with satisfying cleaning results.